Gray Wolf Craft Distilling, fostered by Lyon Distilling Company, is proud to announce the release of their premier spirit, Lone Single Malt Vodka. The Maryland distilling industry continues to expand with the launch of Gray Wolf Craft Distilling. 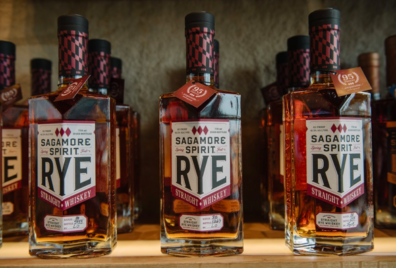 In an unprecedented and innovative collaboration; Gray Wolf Craft Distilling has found their manufacturing home within the walls of Lyon Distilling Company on the Eastern Shore. It was a fortuitous meeting and a shared dedication to true craft that brought these two distilleries together. “I consider myself an outside of the box, nontraditional distiller and I welcome the challenge of bucking industry traditions,” says R.B. Wolfensberger, lead distiller and co-founder of Gray Wolf Craft Distilling, when asked about this unique enterprise. Lone Single Malt Vodka is the inaugural spirit launch from Gray Wolf Craft Distilling. Affirming their authenticity and passion for creativity, Lone is milled, mashed, fermented, distilled and bottled by hand. It is made from one hundred percent malted barley. “I know of only a handful of other distilleries in the world using a similar formula,” says R.B. Wolfensberger. The result is a clean, crisp neutral spirit that has the slightest hint of malt sweetness. Lone Single Malt Vodka will be available at Lyon Distilling Company in Saint Michaels, MD and for distribution to Maryland based bars, restaurants and liquor stores beginning October 31, 2016. It will be available for distribution to Washington, DC in the weeks that follow. Gray Wolf Craft Distilling was founded by husband and wife, R.B. Wolfensberger and Meghan Brown. Long time bartenders in DC and residents of Annapolis, MD they struggled to find the best site to actualize their newest venture. They are proud to be part of this unconventional partnership.